This international bestseller-now with a brand-new cover-features a new chapter and never-before-seen photos! 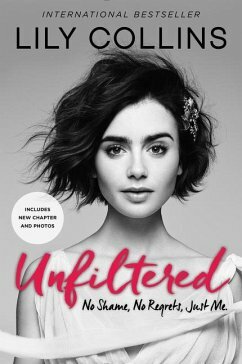 In her groundbreaking debut essay collection, actress Lily Collins-Golden Globe-nominated star of Rules Don't Apply, Mortal Instruments, and To the Bone-is opening a poignant, honest conversation about the things young women struggle with: body image, self-confidence, relationships, family, dating, and so much more. Lily shares her life and her own deepest secrets, underlining that every single one of us experiences pain and heartbreak. We all understand what it's like to live in the light and in the dark. For Lily, it's about making it through to the other side, where you love what you see in the mirror and where you embrace yourself just as you are. She's learned that all it takes is one person standing up and saying something for everyone else to realize they're not alone. By turns hilarious and heartbreaking, Lily's honest voice will inspire you to be who you are and say what you feel. It's time to claim your voice! It's time to live your life unfiltered. Entertainment has been a big part of Lily Collins's life since her childhood. In 2009, Lily made her film debut in the Academy Award-nominated film The Blind Side, and in 2016, she was nominated for a Golden Globe for her performance in Warren Beatty's Rules Don't Apply. Her other projects include Mirror Mirror; The English Teacher; Stuck in Love; The Mortal Instruments; Love, Rosie; To the Bone; Okja; and Halo of Stars. Lily also has a passion for journalism, which she discovered at the age of fifteen while working for ELLE Girl UK. Later, she reported on the 2008 presidential election for Nickelodeon, covered the Democratic and Republican National Conventions in a Seventeen magazine blog, and was a contributing editor for CosmoGirl and the Los Angeles Times Magazine. Lily has always strived to empower young people to use their voices, starting in high school, where she trained to be a teen therapist. Within the last few years, she has taken part in national events focused on encouraging today's youth to stand together and speak out. Unfiltered is Lily's debut book.